The feasibility of using pulsed laser-generated acoustic emission signals and plasma optical emission signals to monitor laser fragmentation of urinary stones was studied in vitro. A flashlamppumped, tunable-dye laser, operating at a wave length of 504 nm (coumarin green), was used as the laser source. Acoustic signals were recorded with a hydrophone which has a useful frequency response of up to 350 KHz. Plasma optical emissions were transmitted retrograde along the laser fiber and reflected through a beam splitter to an optical detection system consisting of a series of spectral filters (to transmit plasma radiation from 380 nm to 440 nm and to block any 504 nm laser light) and a photomultiplier tube. 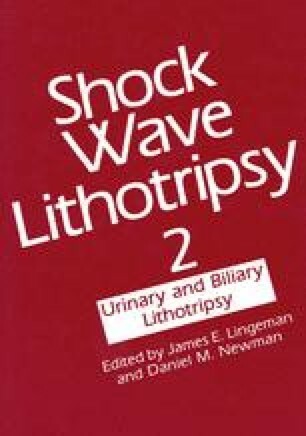 Measurements of acoustic and plasma signals were taken from urinary calculi of several compositions, guide wires, catheters, blood, blood clots, bruised soft tissue, and normal ureter. Signals were also obtained from stones placed in the ureter of an ex vivo bovine urinary tract specimen. Results of monitoring both plasma and acoustic signals show that it is possible to determine, without direct vision, whether the laser is hitting stone, hitting ureteral wall, or being discharged in the lumen. Strong plasma signals and strong acoustic signals are produced by calculi; strong acoustic signals but no plasma signals suggest that the laser is hitting blood clot or bruised ureteral wall. Absent plasma and acoustic response indicate that the laser is discharging against normal ureter or in the lumen. These distinctions may allow clinical stone fragmentation without direct ureteroscopic vision.